Think Napa Valley and you probably think Cabernet Sauvignon. But, this past week, I spent three days at the first annual Wine Writers Educational Tour, taking a deep dive into Napa Valley. Of course, I tasted a lot of very good Cabernet Sauvignon and learned about the more than 100 soil variations in Napa and more. But we tasting many more wines than Cabernet Sauvignon and one wine that stood out over the week was a Riesling! The Smith Madrone Riesling is the Please The Palate pick of the week. Smith Madrone Winery was started by brothers Stuart and Charles Smith in the fall of 1970. They purchased their property, an abandoned vineyard, on Spring Mountain. A densely forested property, they logged the land and with the idea to make great wine, planted Riesling, Cabernet Sauvignon and Pinot Noir. The Pinot Noir was later grafted over to Chardonnay, Merlot and Cabernet Franc. When Stu Smith was asked why he planted Johannesburg Riesling, he explained that in 1970 and 1971, all of the grapes sold for the same amount of money. A white wine boon came in the mid-1970s but then the red wine boon followed and much of the Riesling in Napa began to be pulled out. “Riesling is not a great white wine,” explained Stu Smith. “It is one of the great wines of the world.” And in 1979, they entered their Riesling in a wine competition sponsored by the French restaurant guide Gault Millau. Smith-Madrone’s Riesling was selected, above German Rieslings, as the Best Riesling. 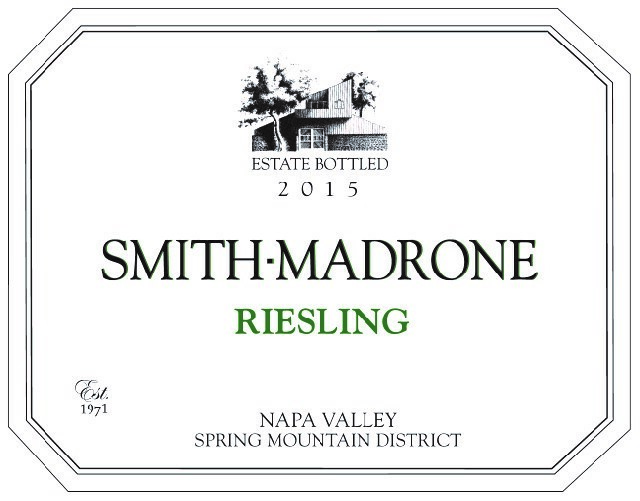 The Smith Madrone Riesling is a dry-style Riesling that represents the pure expression of the grape. And, like good Riesling, it has great aging potential as we discovered as we tasted two vintages side-by-side. 2015 Smith-Madrone Riesling, Spring Mountain – The minerality is screaming out of the glass. With fresh aromas of lemon, green apple, apricot and wet stones, this wine is powerful but elegant. It is crisp and bright and the acidity dances on the tongue. This wine is just so enjoyable! 2006 Smith-Madrone Riesling, Spring Mountain – With more than 10 years of age on this wine, the wine has picked up fusel oil aromas and a honey character but on the palate it still fresh and bright with crisp acidity. Just thinking about the Smith Madrone Riesling, the Please The Palate pick of the week, makes my mouth water! This entry was posted in Wine and tagged Napa Valley, pick of the week, Please The Palate, Riesling, Smith Madrone, Stu Smith, Wine Writers Educational Tour, WWET by Allison Levine.